A building method as old as dirt is being re-examined as a 'new' and viable modern construction material. Compressed soil, also known as rammed earth, is a method of construction that dates back centuries. UBC Okanagan engineering professor Sumi Siddiqua, who has been researching the resurgence in rammed earth, says conventional cement is still the go-to for modern engineers. "Conventional cement construction is the principle building material for buildings, roads, pipelines and bridges around the world," says Siddiqua. "But builders today are seeking cheaper and more environmentally responsible construction materials. One such material may be compressed—or rammed—earth." Soil can be used in many ways, explains Siddiqui, including rammed earth walls, earth bricks and compressed earth blocks. In 2014, nearly 40 per cent of the world's population still lived or worked in structures using soil as a construction material. The benefits of using these natural and locally-sourced materials include a reduction in costs and in energy consumption. The rammed earth walls are usually placed between molds and binded by clay. But Siddiqua says while the technique is simple, it has significant structural limitations. 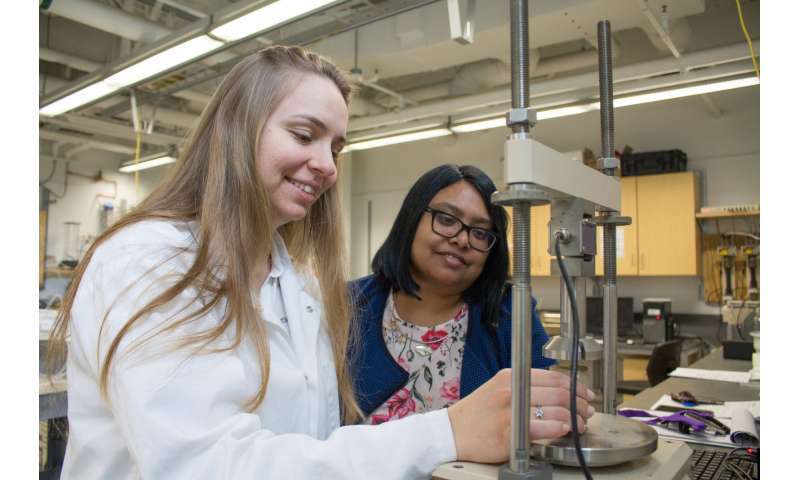 To improve this, Siddiqua and her graduate student Priscila Barreto tested the addition of calcium carbide residue and fly ash as binding agents in the rammed earth. They found that when cured for 60 days, the walls containing binding agents were 25 times stronger than those without. The increased strength greatly improves their potential for use in modern construction. "The core of our challenge was to pinpoint the strongest composition of binding materials," says Siddiqua. "While research shows that some amount of clay is required to stabilize soils, having a mechanism to better bind the soil grains is the key." Barreto, an international student from Brazil, began this research while at UBC Okanagan as an undergraduate and continued the work into her graduate studies. "In countries like Brazil and regions like the Sertão in the country's northeast, rammed earth is commonly used as a building technique," explains Barreto. "The opportunity to enable people to build stronger and safer structures with natural soil is one of my central motivations for doing this research." Siddiqua says there is clearly a demand for this type of material and the technique has been used in small cities in Canada, including the Okanagan, where small residential homes are being built with readily available materials. "We targeted rammed earth structures, because local construction engineers have approached us looking to improve traditional rammed earth structures with stabilization techniques like ours." The research was published in the journal Construction and Building Materials, and was supported by both a Discovery and ENGAGE Grant from the Natural Sciences and Engineering Council of Canada.